I moved to England and the imperial measurement units and different temperature scales are a huge problem in everyday life. Temperatures for baking or cooking are mostly stated as Fahrenheit, but the temperature on the oven is stated as Celsius. The conversion is not straightforward because both temperature scales use different fixed points and scale widths. Therefore a Celsius Fahrenheit Converter is a useful tool. How to convert Celsius to Fahrenheit without the use of a calculator? There are some mnemonics and rules of thumb to give an approximate estimate about temperature conversion. Those who want to convert baking temperatures are lucky. The temperature can be easily doubled or divided by half. The following Celsius To Fahrenheit Conversion Table shows the temperature between 200 and 500 degrees Fahrenheit and their approximated degrees Celsius equivalent, as well as the error of the approximate conversion. If you consider that baking temperatures are mostly between 150°C and 220°C, then the maximum error would only be 7 degrees centigrade. A more accurate conversion is not always necessary. For example 350 Fahrenheit equals 176.67 Celsius. If you would use the rule of thumb the error would be 1.67 degrees centigrade. This error is negligible in most circumstances. Be aware that this rule of thumb only works with baking temperatures and does not work with lower temperatures like the ones seen on the weather forecast. Should the weather forecast predict a sunny day of 32 degrees Fahrenheit, and you expect 16 degree Celsius using this rule of thumb; then you will most certainly be freezing. This is because 32 degree Fahrenheit equals 0 degrees Celsius. However, don't be afraid as this example shows you another mnemonic. As I said, 0 degree Celsius equals 32 degrees Fahrenheit. Furthermore, 16 and 61 is a good number for the conversion of Fahrenheit to Celsius. Because 16 degree Celsius equals approximately 61 degrees Fahrenheit. Therefore, to convert Celsius to Fahrenheit it is not always necessary to use difficult mathematics. 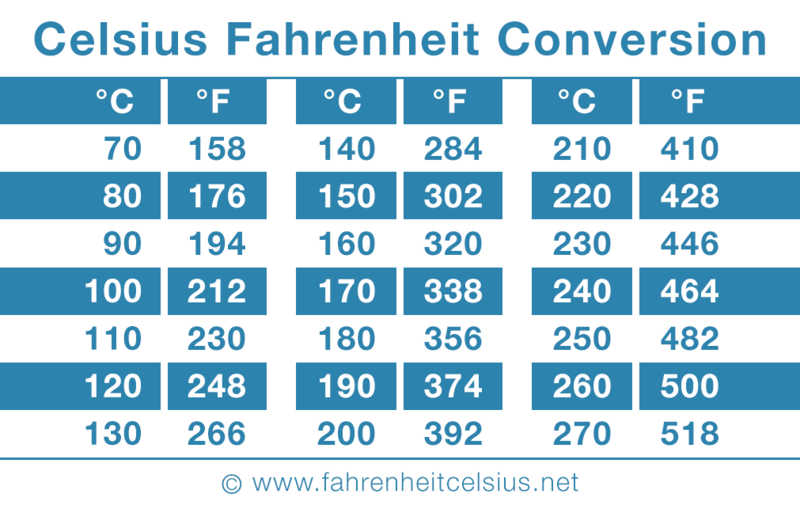 But, if you need an accurate conversion then you can use the Celsius Fahrenheit Converter above. Just fill in your values in one of the boxes and click outside of the boxes to convert. In addition, you can find the Fahrenheit Celsius Conversion Equations and historical information on the development of the Fahrenheit scale and Celsius scale. This is a check card sized conversion table for cooking and baking temperatures. You can print it and pin it on your fridge.